The Madison Mountains span a border between the Beaverhead Deerlodge and Gallatin National Forests. It is bordered by Bozeman to the north, Gallatin River to the east, West Yellowstone to the south, and Madison River to the west. Summer activities include biking, camping, backpacking, fishing, mountain biking and viewing wildlife. 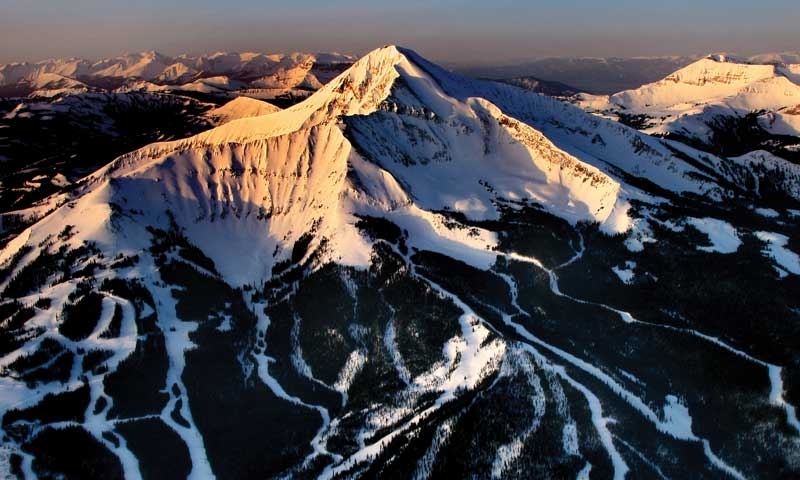 Home to the Biggest Skiing in America at Big Sky Resort. Lee Metcalf Wilderness includes Montana's tallest peaks outside of the Beartooth Range. This 80-mile mountain range is the western edge of the Greater Yellowstone Ecosystem. What can I do and see in the Madison Mountains? In the heart of the Madison Mountains and the primary peak of Big Sky Resort, Lone Peak is easily accessed via chairlift, tram, and hiking trail. The best way to explore the Madison Mountains from Big Sky is via numerous hiking trails. Beehive Basin: A nice network of trails in Beehive Basin is great for hikers and mountain bikers. Grab a map from the visitor center as you drive into Big Sky. Ousel Falls: This 2 mile round trip trail is easily accessible from Town Center and great for kids. Dudley Creek: Just north of Big Sky the 8 mile trail to Dudley Lake offers great views with few hikers. Enjoy the wilderness all to yourself. The craggy heart of the range is the 250,000-acre Lee Metcalf Wilderness, which consists of four discreet areas or units: Bear Trap Canyon, Monument Mountain, Spanish Peaks and Taylor-Hilgard. The Taylor-Hilgard Unit boasts Montana’s tallest mountains outside of the Beartooth Range, including Hilgard Peak, at 11,316 feet. The Spanish Peaks Unit sees the most use, with hikers and mountaineers making use of the 110 miles of trails. On the northwest boundary of Yellowstone National Park, the 30,000-acre Monument Mountain Unit is isolated and least visited. This is prime grizzly bear habitat, with one of the largest populations of the great bears in the region. The 6,000-acre Bear Trap Canyon Unit – a fantastic and rugged piece of canyonland, with cliffs up to 1,500 feet towering over the Madison River – was the first piece of the range to be designated wilderness. Hikers and backpackers enjoy the view from the banks, anglers venture into the ripples for fishing, and rafters challenge themselves on the whitewater of the river, including in the famous Class IV.V “Kitchen Sink” rapid. At the southern edge of the mountain range, Hebgen and Quake Lake sit nestled up against steep mountains. Enjoy boating on Hebgen Lake and an interesting visitor center at Quake Lake. Where is the Madison Mountain Range? Stretching 80 miles from West Yellowstone to Bozeman, the range marks the western boundary of what is known as the Greater Yellowstone Ecosystem. To its west flows the Madison River, to its east the Gallatin, both of which empty into the Missouri River. The Madison Range encompasses Big Sky. Call either the Beaverhead Deerlodge National Forest at (406) 683-3900 or the Gallatin National Forest at (406) 522-2520. The Tobacco Root Mountains lie west of the Madison Range.